“No one can imagine the beauty of the view from anything witnessed in England. 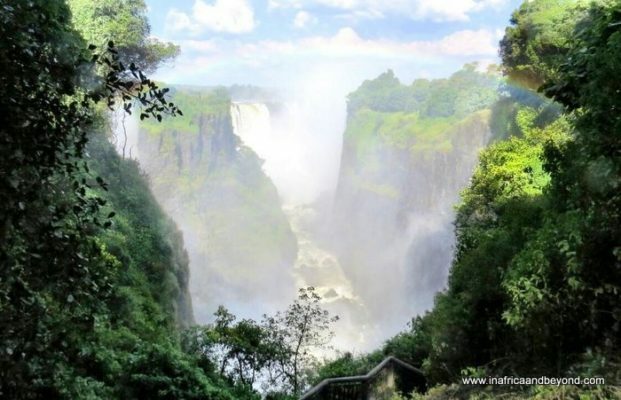 It had never been seen before by European eyes; but scenes so lovely must have been gazed upon by angels in their flight.” This is what David Livingstone said when he first witnessed the Victoria Falls, on the border of Zimbabwe and Zambia. Two-thirds of this natural wonder of the world lie on the Zimbabwean side, and should be on every traveller’s bucket list. Wildlife and waterfalls. These are two of my favourite things. 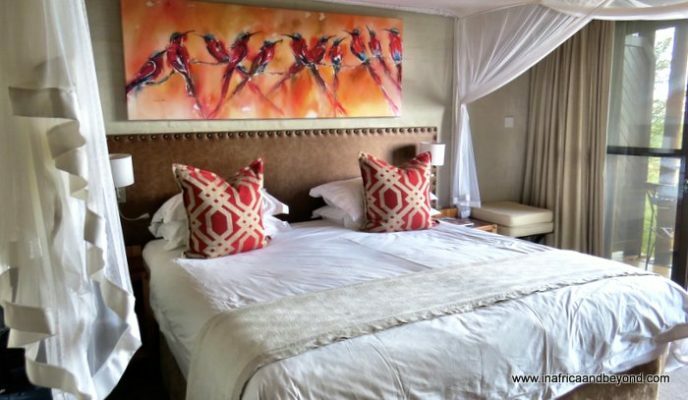 A stay at the Victoria Falls Safari Lodge encompasses both of them in generous measures. 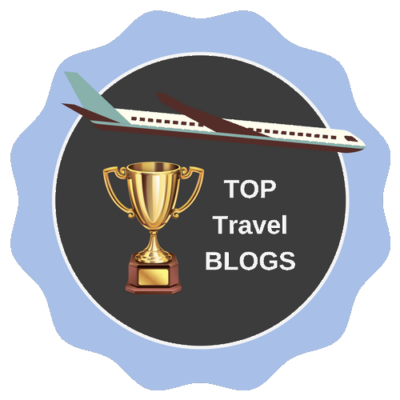 Voted Zimbabwe’s Best Safari Lodge for the past 22 years by the Association Of Zimbabwe Travel Agents (AZTA), this award-winning lodge boasts an amazing location. It is perched on a ridge looking out onto a shimmering waterhole in the Zambezi National Park, with wilderness as far as the eye can see. 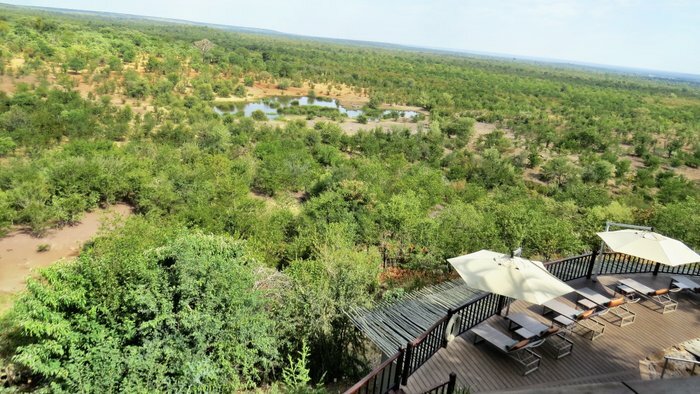 The rooms and the public areas have great views of the waterhole, which attracts a steady stream of wildlife. My eyes were constantly drawn towards it no matter where I was at the lodge. During the course of my stay, I saw elephants, buffalos, zebras, warthogs and various antelopes drinking there. One morning while having breakfast at Makuwa-kuwa Restaurant, I watched a herd of impalas drinking water. Suddenly a crocodile sprang out of the water and tried to grab one. The impala managed to escape but the herd didn’t go far. 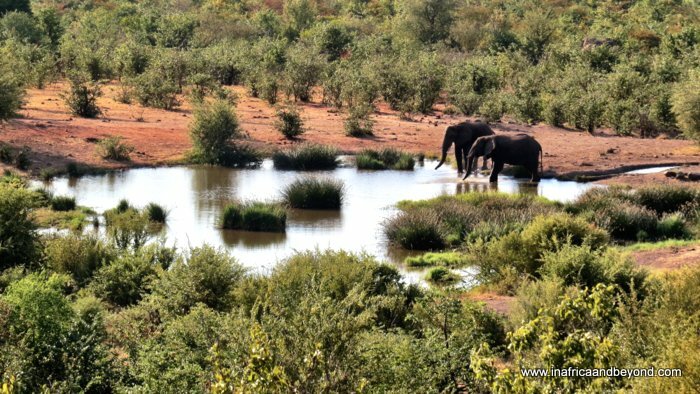 They just moved to another side of the waterhole and the crocodile slinked stealthily towards them, under the water. Unfortunately, we had to leave so we couldn’t see how this scene unfolded. The magnificent Victoria Falls are just 4 kilometres away from the lodge, and are easily accessible with the complimentary shuttle which leaves every hour. 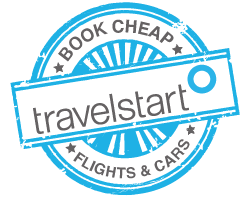 The shuttle also makes several stops in the town of Victoria Falls which is 3 kms away. We used it several times and it was always punctual and comfortable. The 72 rooms are housed in thatch-and-timber buildings. We shared two inter-leading rooms with our children, who loved having their own space. The warm, ethnic décor was attractive, and the huge beds were surrounded by mosquito netting. There are no televisions in the room, not that you miss them. However, there is a television lounge in the main lodge. Welcome platters of dried fruit and Grapetisers awaited us. Each room had sliding glass doors opening onto a private balcony. 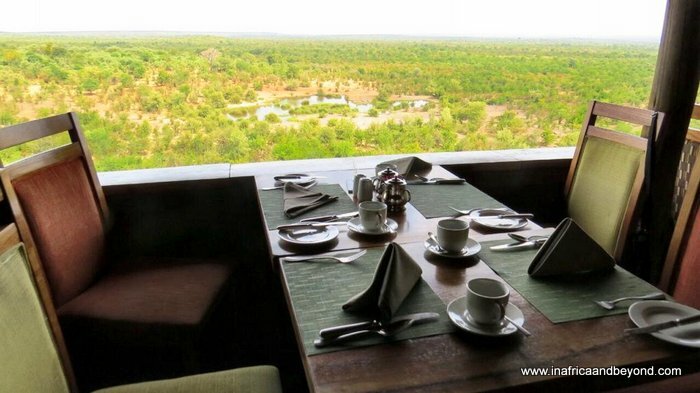 The view from the room was spectacular and I spent a lot of time on the balcony, sipping my coffee while looking out onto the bushveld. 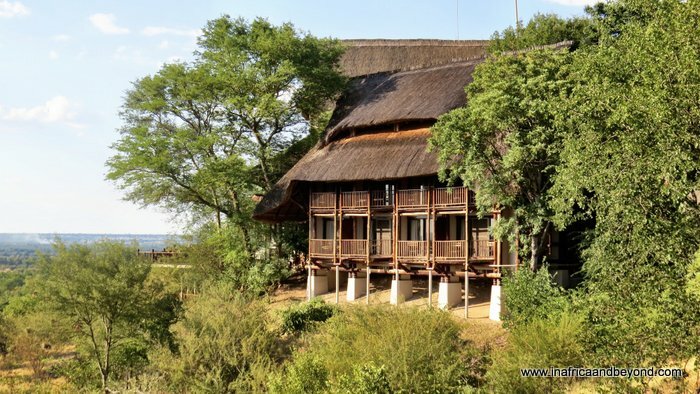 The main lodge is a thatched structure built on split levels, resembling a huge open-plan tree house. 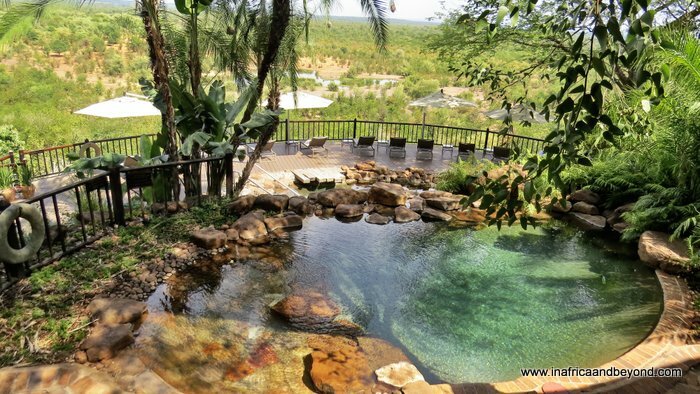 Apart from the restaurant and lounge areas, it features beautiful rock pools, a fitness centre and a viewing deck with spectacular vistas of the surrounding landscape and the sunsets. Complimentary wi-fi is provided throughout the lodge. A highlight here is the Vulture Culture Experience, which takes place daily at lunchtime. Vultures are crucial to the environment, but they are critically endangered. Their numbers are dwindling rapidly due to poisoning, food shortage, electrocution by power lines, use in traditional medicine and other factors. 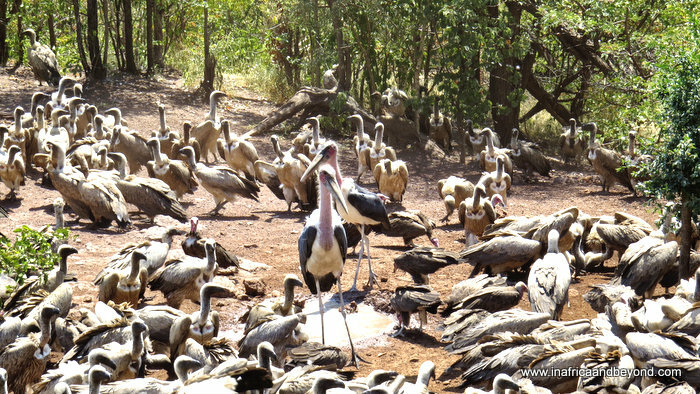 There are five main types of vultures in this area as well as Marabou Storks and eagles. This conservation project, which involves supplementary feeding, helps to aid their survival while educating visitors. I went with my family to observe. Never before had we seen so many vultures in one place, all descending upon the pieces of meat provided to them. My kids were utterly fascinated, and so were we. The sprawling grounds are home to three other accommodation options, as well as The Boma. 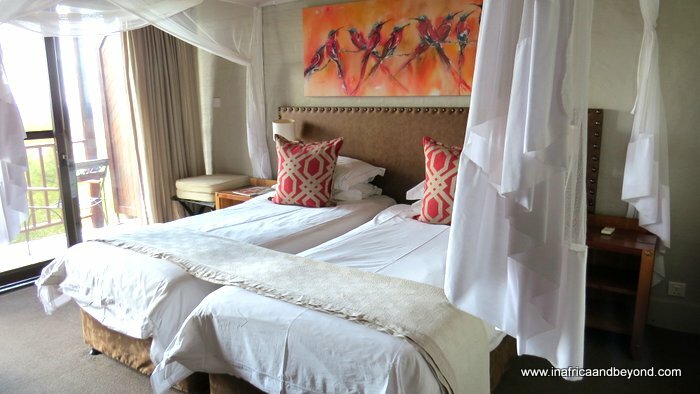 Accommodation includes the ultra-luxurious Safari Club rooms and suites which are accompanied by butler service, the Safari Suites which are the ideal luxury option for families and the self-catering but still comfortable Lokuthula Lodge. Wildlife like antelopes, warthogs and monkeys roam freely around the property. 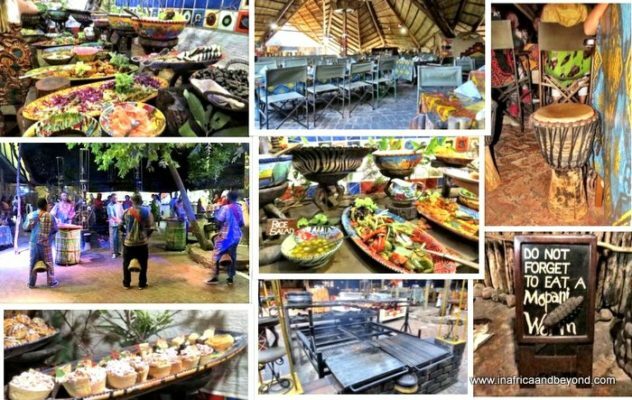 The Boma is a vibrant, interactive experience, combining food, entertainment and local culture. Upon arrival, you are draped in a chitenge (traditional cloth) and welcomed by traditional dancers. A face painter will paint your face, if you wish. Once you are seated, your hands are washed in a traditional hand washing ceremony. A massive buffet feast spread awaits you, and if you have special dietary requirements, a chef will show you around and let you know what you can and can’t eat. If you’ve ever wanted to try mopane worms, here’s your chance. 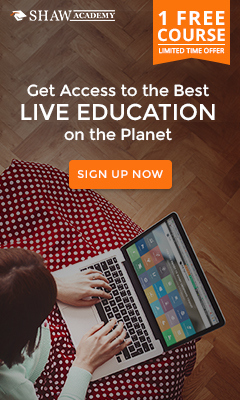 You can even get a certificate to prove it. For those with more exotic tastes you can sample crocodile and warthog. The cultural performances are highly energetic. During dinner, you are given your own drum to beat and we found that it was a great way to relax and unwind. The food was great, and the drumming was fun for all of us. I looked around the Boma and the euphoric faces around me confirmed that our sentiments were shared by everyone else too. 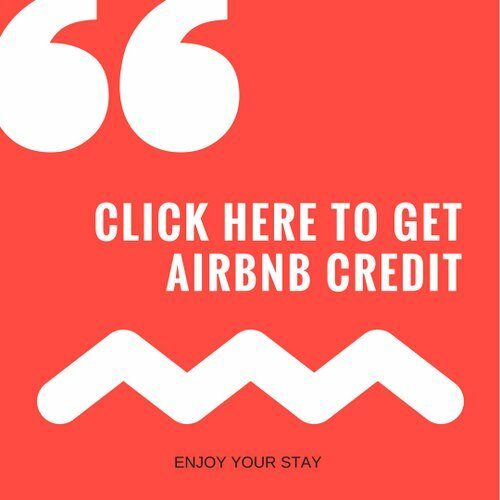 Pre-booking is essential as the Boma fills up rapidly. Guests not staying on the property are welcome too. 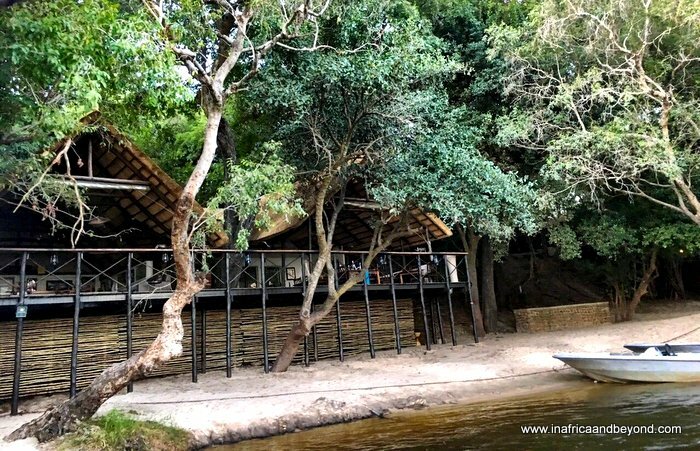 Other activities that can be arranged by the activities desk include game drives, guided walks to the Siduli Hide, and river cruises. 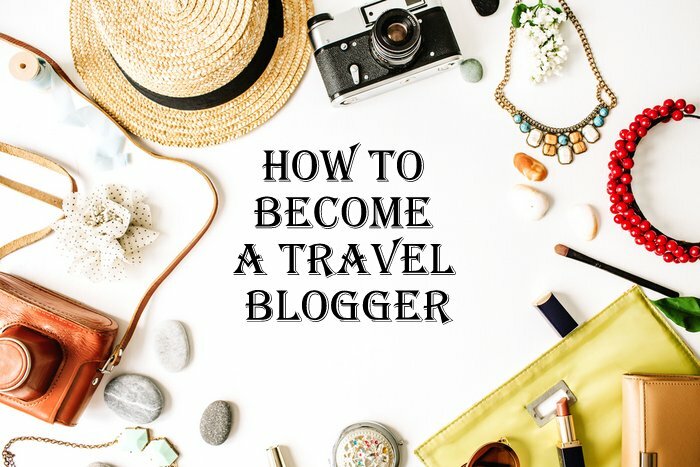 Victoria Falls is known as the Adventure Capital of Africa and there are a myriad of adventure activities in the area, like bungee jumping, skydiving, white-water rafting and zip-lining. 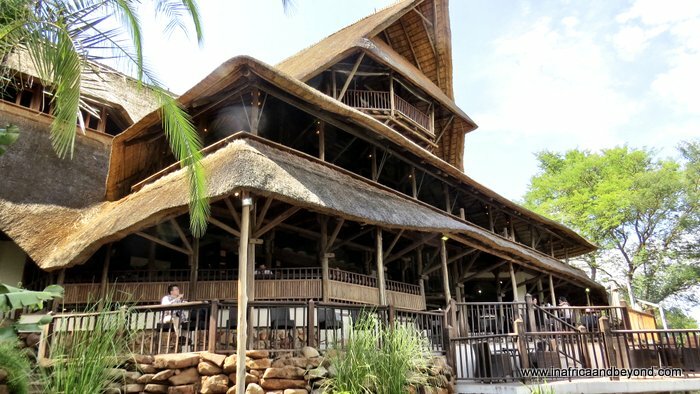 The Victoria Falls Safari Lodge is a great family hotel with an enviable location. Wildlife and waterfall experiences are complemented by warm, and friendly service, delicious food, and comfortable luxury, creating the ideal getaway. 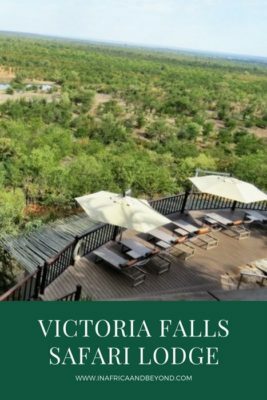 For more information, visit Victoria Falls Safari Lodge or book here. OMG! This is so amazing and very informative. I can’t wait to visit Zimbabwe. 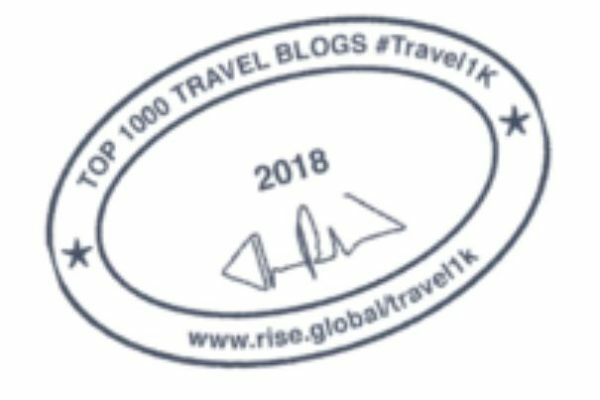 I made a few plans of visiting Zimbabwe and Zambia and now, this article helped me make up my mind. Really looking forward to seeing Victoria Falls too. The Victoria Falls is a must-see but there is so much more to do in the area too, so make sure you go for long enough.